Complex NPK fertilizer with Magnesium and Trace elements for all culture types. It is characterized by elemental completeness, uniform distribution of macro and micronutrients in all of the grains, high water solubility of Phosphorus and high Potassium and Sulphur content. The well designed formula, special proportion and high solubility, increase the nutrients absorption and they fully satisfy the needs of plants, ensuring balanced and harmonious nutrition to the cultures fertilized with it. 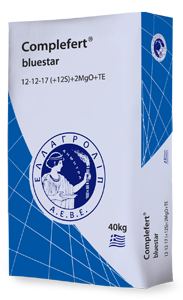 In the context of basic fertilization, Complefert® bluestar guarantees successful installation and robust plant growth. When used on the surface, in later growth stages, it promotes flowering, increases boll retention and improves the qualitative characteristics of the crops. Ideal for the basic fertilization of all cultures (Arboriculture, Viticulture, Vegetables, Big Culture) in all soil types.